Sue Austin goes deep sea diving … in her wheelchair. She explains in a TED talk how she experienced the very negative stereotypes linked to wheelchairs, and thought how it might be to juxtapose these with the excitement of scuba-diving. Her NHS electric wheelchair now gives her the “freedom to move in 360 degrees of space”. The ecstatic nature of wheelchair diving – Sue’s “experience of joy and freedom” – is felt by her audiences too. Their eyes “literally light up” as they “want one [of those wheelchairs] too”. Sue wonders if, when people “see something they have no frame of reference for … they have to think in a completely new way”. Perhaps this new sort of thinking even “spreads to the rest of .. [their] lives”. 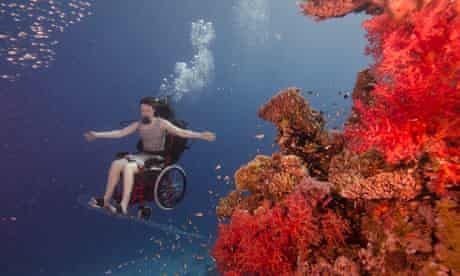 As she says: “for me, [wheelchair diving] means that [the audience is] seeing the value of difference, the power and joy of seeing the world from exciting new perspectives”. Sue’s wheelchair, named ‘Portal’, has “pushed [her] into new dimensions and a new level of consciousness”. It’s not just about art through underwater wheelchair diving, Sue is taking to the skies in a flexwing microlite. And she is using immersive technology in 360 Degrees – a New Angle on Access. This uses “portable 360° interactive headsets plus affordable, transportable 360° installations for small arts, community and educational venues, [to] research meaningful, home and community based, inspiring art experiences for audiences currently excluded from accessing arts venues due to disabling physical, psychological, and financial barriers”. Doesn’t Sue tap into experiences and expertise which so-called able-bodied individuals can only dream of? If, that is, they could even dream of such things.